My daughter has attended Teresa's class since May 2016. She started from "zero" experience with flute till now that she can play many lovely pieces. It's hard to believe the first thing in the morning she likes to do before goes to school is playing her flute. 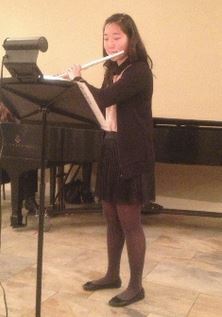 Teresa's passion in flute has great influence on my child. Teresa teaches kids from fundamental breathing skill to music articulation. There is always positive environment in her class, so we all look forward to attending her class every week. I believe music is a performance art. Since we join this studio, my daughter has participated in many performance opportunities. Teresa is dedicated in providing her students performing opportunities in many places. Her passion f or music and teaching , her care of her students and her professional flute knowledge make her the best teacher in the Bay Area. 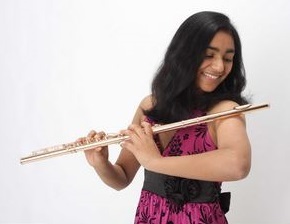 Apoorva Rangan shares her experience with Teresa's teaching - Apoorva, 2014 First Place Winner of NFA High School Young Artist, Flutist with SFYO, former principal flute SJYS, ECYS, CYS, senior at Harker Academy and Future Yale Student. "Teresa's kind-but-firm, cross-cultural, and intensely personalized style of teaching is a rare gem. As my primary teacher over the last 6 years, Teresa has pushed me to go beyond my self-conceived boundaries with immense positivity and support. With her help, I'm finally able to see myself as an individual and an artist. What I love is the unexpected element in each lesson, where Teresa's supportive individuality shines through. 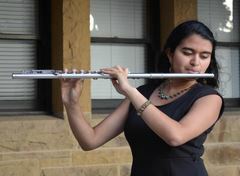 She is not afraid to go beyond traditional techniques, though her rigorous technical exercises help set a backbone for good flute playing. Bongos were used to teach me tempo, whistle tones were used to teach me nuance, and anecdotes were used to remind me that music is a journey of fun, growth, and sharing. And Teresa's interest in her students goes beyond the musical. One of her main goals as a teacher is to give her students confidence, to motivate them into playing more challenging repertoire, memorizing pieces, and participating in competitions and masterclasses. I learned from Teresa that the act of "putting yourself out there" is a victory in itself. Without her guidance, I would never have learned the skills to believe in myself as an artist and a person. Flute can seem like a lonely activity, but with someone like Teresa by my side, it's become a joyous team endeavor." Sharing her account of studying with Teresa - Pavitra Rengarajan, Stanford University, past SFYO, SJYS, and ECYS. "...Teresa, she has had such a remarkable influence on my growth both as a musician and as a person. Her musical expertise and passion to share her love of music with others are apparent in each private lesson. She has an incredible ability to note specific details about embouchure, technique, intonation, and tone color while simultaneously ensuring that the overall character of the piece, whether it be a beautifully restrained Bach Sonata or a rhythmically fiery Piazzolla duo, is not compromised. She has been a consistent source of support and guidance through many of my musical adventures. Over the years, Teresa has become much more than just a flute teacher - she is a lifelong mentor, supporter, friend, and second mom to me. Teresa has such a warm, energetic, and radiant personality that allows her to form close relationships with all of her students. She is full of life and lights up any room she walks into. Having taken lessons with her for several years, I can say with certainty that she is truly one of a kind, and anyone who gets the opportunity to work with her is incredibly lucky." Letter from Pavitra, finalist of NFA 2010, flutist SFYO 2009-2012 and now Junior at Stanford University . "Thank you so much for being such a positive influence on my life for the past several years. It seems like just yesterday that I was in the joint flute choir playing "Planets" for the first time, and it brought back a lot of memories playing it last year in SFYO. I love your bright personality and unbelievable energy, and I couldn't have asked for a better teacher! Thank you for helping me grow as a musician, an artist, and a person over the last few years. I'll miss seeing you every week for our lessons, but I'll be in the area so I'm sure I will see you around. Much love always, Pavitra"
"Thank you for being an awesome flute instructor. I can't imagine where I would've been without your guidance. I sincerely admire your love for music and I'm glad that you have been able to share that with me. You truly instilled a love of music within me and have always inspired me to not give up and try my best. Thank you for always supporting me in all my endeavors. First meeting you in flute choir to me in my senior year now has been full of precious experiences and memories that I will treasure forever. I am so lucky to have met you and I wouldn't have asked for another flute teacher more supportive, talented and caring than you. I couldn't have achieved nearly everything that I have done with the flute without your guidance. Wish you the best in the future and let's keep in touch! love, Gina"
"Thank you so much for being a fabulous teacher for the past four years. I enjoyed every lesson with you and I learned so much from you. You will always remain as a part of my life. Through your teaching, I was able to grow as a more mature person. Like you said, I'll never give up, never stop playing the flute. Thank you again, for being a great mentor and friend. love, Alice"
"I am so thankful for all the lessons we have had and for your great teachings. I've learned so much from you! (Especially relaxing my fingers). Thank you so much for giving me many opportunities to enter competitions and participate in master classes. You were the best teacher I have ever had and I'm so glad I got to learn from you. Love Yeona"